Coaches from London to Spain are operated by Eurolines, the large European long distance coach network. One way standard ticket from London to Spain costs from £90. Travel time between the UK and Spain varies and depends only on the distance of the region to which you want to travel and where the coach stops along the way. Generally, it can be concluded that the time frame is between 24 and 36 hours. In the UK coaches to Spain start in London, but passengers must change coach in Area Suco. From there are many convenient Eurolines’ connections to various regions of Spain. Sometimes you'll be forced to do an additional change to another coach, but you don’t have to worry because they’re well-organized. In addition, all the details of your journey will be included in the ticket. The coaches go overnight and they are very comfortable. Most of the time the coaches go on British, French and Spanish motorways and most people don’t have trouble sleeping on the coach. Regular stops are made every few hours. All Eurolines coaches have on-board toilets, reclining seats and air-conditioning as standard. London to Paris operates EUROLINES PLUS coaches, so in addition to the above you can watch DVDs whilst taking advantage of extra legroom. On the part of the route you can use a free Wi-Fi. (for routes between London - Paris only) The cheapest way to travel to Spain is definitely the coach. If you are on a tight budget, then taking the coach in Europe can offer some amazing cost savings. Whilst offering excellent fares some of these coach companies featured offering a very high-quality service - you can expect reclining seats, extra hold luggage, free wifi, sometimes they offer you free tea or coffee and you also have power sockets at each seat. There are up to 5 pairs of coaches per week between London and Spain, so there is a connection almost every day. You can see the exact coach timetable and all stops on the Eurolines website Note that the timetable and fares can change over time. London, Paris, Madrid or Barcelona are among the most visited cities in Europe and the coach routes between them are very popular. The coach can be fully booked even several days before departure. It is highly recommended to book in advance, especially when you are less flexible with dates of travel. How to buy coach tickets from the London to Spain online? How is the journey to Spain by Eurolines? 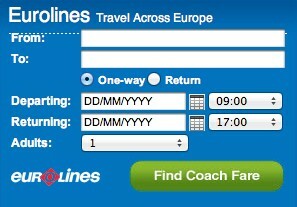 You can reserve a seat online, If your journey begins from the UK, you just go on the Eurolines UK web page. The Eurolines offices are usually located inside the long distance bus stations, but it can also be a travel agent in the city. - - - Arr. PARIS, Interchange only Dep. - - - Dep. PARIS, Interchange only Arr. During peak times all passengers travelling to Spain must pay a supplement on top of the normal ticket prices of £4 (single) or £9 (return). During peak times all passengers travelling to Spain (Barcelona, Valencia & Murcia route only) must pay a supplement on top of the normal ticket prices of £7 (single) or £10 (return). How to buy tickets online for travel from Britain to Spain? Each week Eurolines provides for their passengers up to 3 coach services to and from Spain. Transport from London to Spain is partially carried out with traditional Eurolines’ coaches and with modernized Eurolines Plus coaches. All Eurolines’ coaches have on-board toilet and washroom facilities, reclining seats and air-conditioning as standard. Sometimes the coach that picks you up from your departure point has only the final destination displayed on the front windscreen. This is because the majority of Eurolines routes include multiple stops and it would be impractical to display every stop on the front windscreen. Also, you may have booked a journey which requires a change of coach. In both examples, please ask the driver to confirm that his/her coach is going to the destination stated on your ticket. Eurolines put the safety and comfort of passengers first, so the vehicles are equipped with a large number of safeguards. The operators are using modern vehicles with large panoramic windows and increased legroom. Once you get to Dover (for the ferry) or Folkestone (for the train) you’ll have to go through passport control – the driver or coach attendant will explain exactly where and when to get off. On entry at the ferry port or Eurotunnel terminal, customers will be required to disembark from the vehicle and pass through both UK and French Border Control offices and show their passports. In Folkestone and on board the ferry you can find a restaurant, shops, bars, cafes, arcade games and loads of sitting spaces – so you can keep well entertained for the 1 hour 30-minute crossing. Will the international coach stop for a break? Of course, on the majority of services. All international coach operators provide refreshment breaks on longer journeys, especially overnight services. The European law obliges the driver to take a break every four and a half hours. Each passenger is entitled to transport two pieces of primary luggage (suitcase, travel bag or backpack) of total weight not exceeding 30 kg. In addition to the main luggage, the passenger has the right to carry one piece of hand luggage weighing up to 5kg. Luggage exceeding the limit as mentioned earlier can be transported with the crew’s consent only if there is enough space in the luggage hold. For each additional luggage (1 piece, up to 25kg) or for exceeding the permissible weight of the primary baggage, the carrier shall charge a fee. Our Accommodation page offers access to over one million verified accommodation reviews via Tripadvisor, allowing you to see what other people thought of a place before you book. And with rooms or hostel beds from as little as £3 per night, you can expect great value for money when you book with Europebus. The best way to protect against unexpected accidents is to buy travel insurance. In my opinion, so that the journey is stress-free, you should never travel without travel insurance. You can insure only for travel, it’s possible directly on the Eurolines website, during ticket purchase. You can also insure individually with another insurer. This will be the insurance that will apply during the journey and while in a foreign country. The insurance should cover a loss of cash and goods, cancellation of travel and the main treatment abroad. If you travel several times a year and want to save money, you may want to buy an annual insurance policy. Click here to buy insurance. If you're going on holiday, a prepaid currency card is a great item to have in your wallet. Here, we take a closer look at prepaid card option from My Travel Cash. There are a lots of great reasons why using a one of MyTravelCashs’ currency cards. They've found that different types of travellers use their products for different reasons, so, they've created special tailored products, for example, Euro Currency Card, US Dollar Currency Card and Multi-Currency Card. Do you need a fast, reliable car hire service when on holiday or business trip? Rent with recognised agents; we provide quality hire cars and a friendly service at a great value price. Use one of the links on Rent a car page to be redirected to a recognised agent. Let's go: Enter your rental dates, a town name in the form to get a car.